Sweaters, scarves, hot drinks and hotter fires. Trees ablaze with changing leaves, crisp air, and the promise of shorter days. Harvest moons, cider presses, and pumpkin patches. Leaves falling, their work done above, now to insulate below. Fall feels cozy. It reminds me to slow down just a bit, a lesson I have to learn over and over again in this life. And all the things I love about Fall, they help me to slow down, calm down, cozy up, and be still for a moment. Do you have trouble slowing down? Do you struggle to sit still? Is meditation hard for you because your mind spins and the only thing you can think about is how much you should be doing or all the wild (and totally legitimate!) things you have to worry about? I hear you. I feel you. That monkey mind is no joke. Even as I want to enjoy wandering through the pumpkin patch, I can’t help but remember the article that isn’t finished, the workshop handout that needs another edit, the networking event that I should make it to. There’s always more to do. Who has time to be still? And yet, you know that you need it. You deserve it. Your body craves it even as your mind fights the surrender to stillness. What to do? As we move into Fall, I encourage extra focus on the lungs and the large intestine based on Chinese Medicine. The lungs and large intestine are important for circulation, heart health, and digestion. But what does this have to do with stillness, you ask? There is this magical connection between stillness, meditation, and breath. Breath. Our lungs play a crucial role there. And in practicing mindful breathing, there is an element of stillness. But we fight stillness in our culture. We fight it for so many reasons. We think it looks lazy, it’s not productive, it makes us seem weak. Underneath those fears, I often find this: We are afraid to be still because we don’t like who we are. We are afraid we can’t get comfortable with ourselves. And you know, it’s true. We can’t get comfortable with ourselves if we’re unwilling to give it a shot. Just like any relationship worth having, your relationship with yourself requires investment, time, and nourishment. Treat yourself with kindness, gentleness, strong encouragement, and allow yourself to practice mindful breathing. Even if you’re scrambling with professional responsibilities or a stay-at-home parent with so much to keep track of 24/7, you can do this. It may come in small doses. But it is always an option. Meditate. It doesn’t have to be in front of an altar on a circular cushion. You can do this anywhere. Try the exercise of focusing on your breath. Can’t sit still? Don’t worry. Move in the ways that feel right to you. (I have a good friend who does running meditations. It still can bring a type of stillness.) Keep coming back to your breath. Moving meditations are wonderful. So is physical stillness. Do what works for you. Keep coming back to your breath. 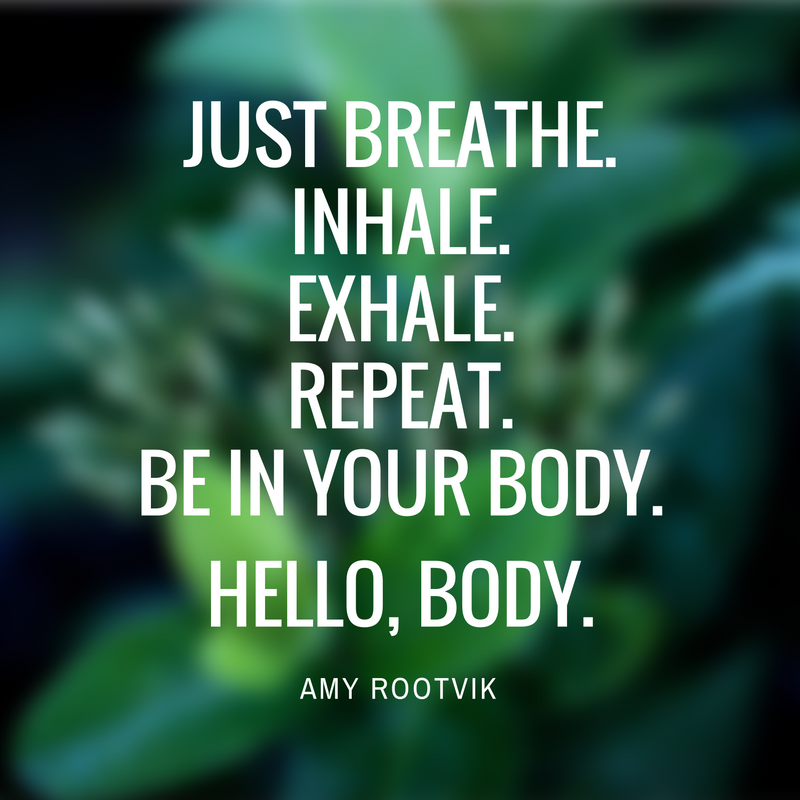 Let your belly expand out, then as you exhale, pull it toward your spine. as you inhale, pull the air deep into your lungs and then release fully, cleaning out the cobwebs at the base of your lungs. Notice where you’re holding tension. Notice where you feel heavy, where you feel light, where things feel good, or not as good as you wish. Pay attention as you drop into your body. Even a couple of minutes of this makes a significant difference to your stress level, your energy, and your ability to focus. I regularly encourage clients to incorporate breathing exercises into their lifestyle. It’s not just a Band Aid (although it can help almost instantly), but it’s also a practice with long-term benefits for overall health: mindfulness, good oxygenation, the ability to be still and alone with yourself—the wonderful creature that you are. The more comfortable you get with stillness and mindful breath, the more open you are to insight and inspiration. The more you practice, the easier it gets. And the wiser and clearer you get. Breathe — moving oxygen in and carbon dioxide out. It helps, moment by moment, breath by breath, to cleanse and power us. It’s part of the rhythm of our lives that we so often take for granted. There is so much to be gained by noticing the beauty and power of our breath. Own it. Let it fill you up with goodness and help you release all that you do not need. Want to learn more about how to improve your health, decrease stress, and make seasonal transitions with peace and panache? Let me help you. I have two coaching spots opening this month. If you’d like to apply for personalized coaching, contact me here. I’d love to hear your story. There’s no time like the present to take action toward creating the life you truly want. Sign up for healthy lifestyle tips, updates, and subscriber specials. Right now you’ll get 10 Detox Approved Snacks ebook for free! You’re info is never shared with anyone. Ever.